So—anyway...a handful of weekends ago, I'd switched away from the playoff game, trying (in vain, as it turns out) to help out the Colts, who apparently were incapable of scoring while being watched on TV by me. Flipping over to the classic movie channel, I was just in time for the beginning of All That Heaven Allows, which I'd always wanted to see. It's a '50s melodrama directed by Douglas Sirk, with Jane Wyman playing a pure-hearted widow who struggles against the strictures of social convention when she falls in love with a younger man from a lower social class, played by Rock Hudson. Rock's character is nominally her gardener, but one scene finds him at his back-to-nature mountain hideaway with a white stag (the heavy-handed symbol of Jane and Rock's pure and rare love), which he feeds by hand. (Encouraging the deer!...no gardener he.) The film is a curiosity...which is just another way of saying I was really surprised at how awful it was. The plot lurches from points A through Z as if you're being shuttled through bullet points on an outline instead of being taken through a story; Rock Hudson's acting is painfully terrible; and the characters (even those with the benefit of competent acting) speechify to the audience instead of talking to each other. At one point, Thoreau's "lives of quiet desperation" passage from Walden is read aloud to us. The polemics made me grumpy and uncharitable. Was it so very wrong for me to burst out laughing at the scene where Jane Wyman, in a full-on soft-focus close-up, stands with tears rolling down her face, alone and lonely on Christmas Eve, looking out her picture window at the neighborhood carolers singing "Joy to the World"? Todd Haynes's Far From Heaven is often referred to as a remake of or homage to All That Heaven Allows, and although Haynes is unfailingly generous in crediting Sirk for inspiration, Far From Heaven—far from a cover version of the earlier film—is a different movie, and a great movie. The movie is set in 1950's Hartford, Connecticut, with exteriors and interiors done up in colors and costumes just this side of exaggerated, to delicious effect. I've watched this movie repeatedly just to breathe in the colors and the styles, mightily squelching the urge to rip up and redo my basement in teals and oranges, with atomic-age wall clocks and faux-riental knickknacks, swinging sledgehammer and wielding paintbrush while fully dressed in pumps and jewel-toned crinolined dirndl. But there's more to this film than just what meets the eye. The story is a domestic drama of a woman, the friend she makes, and the calamities visited upon them in the ordinary course of human events. Julianne Moore, whom I've wanted to watch in anything (well, maybe except for dopey comedies with Hugh Grant and Pierce Brosnan) ever since The Hand That Rocks The Cradle (where she was the only redeeming feature of that dopey movie), plays the kind and guileless Cathy Whitaker, wife and mom, keeper of the hearth, who befriends Raymond Deagan, widower and gardener, played by Dennis Haysbert (the *sob* late President David Palmer on "24"). Aside from his somewhat odd pronunciation of Hamamelis (my "How do you say" sources confirm it should be Ham-a-may-lis or Ham-a-mel-is, Raymond, instead of "Ha-Ma'am-alis"), and the indignity of having to appear in an early scene dressed in butternut-squash colored slacks, Raymond is educated, cultured, a devoted father, a good friend, and, as we see him on the train that pulls away from Hartford at the end of the movie, makes the irrefutable case for bringing back the fedora. Of course, Cathy and Raymond's friendship can't be permitted—there isn't an electrified line of class, race and gender that it doesn't breach—and, by the end of the movie, Cathy's marriage and the social stature it confers upon her have been wrecked, and Raymond is forced to sell his business and leave the only town he has ever lived in. Disapproving looks and reactions are the dramatic and visual focus in scene after scene, as broadly drawn as the scene with the snooty circle of elephants in Dumbo. So why caricature the narrow-mindedness of that time and place? Oddly enough, I think the events and reactions are overamplified so that they can be neutralized. I don't think the movie was made to Make a Point about the evils of intolerance, or to send the message (as in the Sirk film) that True Love can only be attained once the empty values of bourgeois society are rejected. Once we recognize the overdramatic setting as but an ornate frame, our attention is drawn to the subtle and fleeting moments of hope, happiness, fear, disappointment and sadness, so familiar in our own lives, and seldom regarded as deserving the spotlight unless as a larger-than-life showcase for the manipulative prowess of the artist, or as an incidental detail of plot, which is, after all, where the action is. When Cathy tells Raymond that their friendship must end, Raymond asks: isn't it possible for people "maybe, for one fleeting instant, [to] manage to see beyond the surface, beyond the color of things?" I'll confess that it took more than just one viewing for me to see beyond the surface and color of this movie, but when I return to it, it's to appreciate how it quietly honors the beauty of ordinary human feelilng. Heavenly. With deftly paced plot progressions and quick-cut shifts from uproarious one-liners to soul-chilling moments of dread, this movie takes you on a ride that's over much too soon. I can't remember the last time I've been this satisfied by an "action" movie. In most things artistic, I prefer character over plot, but I've missed more Merchant-Ivory type films than I've seen, and some of my favorite movies feature a fair amount of action (er, violence): Die Hard, To Live and Die in L.A., Carlito's Way (and the only TV series I watch live on prime-time is 24). On the other hand, I've seen less than a half-dozen Westerns (though if you don't count The Seven Samurai, and Clint Eastwood's The Beguiled, which I suppose is a "Southern", not a "Western", then it's really only about three Westerns), enjoyed the even-numbered Star Trek movies but would not go out of my way to see any of them again, and was underwhelmed by Star Wars when it first came out and haven't bothered with any of its sequels or prequels. So I have no genre biases for or against something that's called "SF" or a "Western" or an "SF/Western". I'm just looking for a great character illuminated by a great story. In the imaginary words from the imaginary pen of the truly evil (yet imaginary) Chinese philosopher Shan Yu from the "War Stories" episode of Firefly: "live with a man 40 years, share his house, his meals, speak on every subject. Then tie him up and hold him over the volcano's edge. And on that day you will finally meet the man." 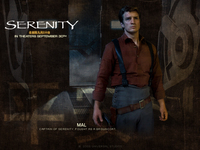 Will you need to have seen Firefly to enjoy Serenity? Nope. The plot's not intricate, and anyone will be able to figure out who to root for in about three minutes. Some moments in the movie will be more resonant and affecting for Firefly fans who became wrapped up in the characters through the series. On the other hand, those who come to Serenity fresh can look forward to being able to get to know all of the characters in more depth by checking out the fourteen episodes of Firefly. Different folks will get different things out of this film, but for me, it begins and ends with Mal: Captain Malcolm Reynolds, captain of his own ship in every sense of the phrase. He's not a hero writ large, a superhuman fighter or a rogue who can coast on his charm; he's a guy, living hand-to-mouth, who values nothing more than his autonomy, except when that pesky little thing called doing the right thing gets in his way. Then, he's impelled to choose good over freedom (or to live with unresolvable regret when he does not), for which he often pays a heavy price. He owes too many of his narrow escapes to dumb luck for us (and him) not to know that it's only a matter of time before his number is up—and then it will be as though he never was. I'll have to go back, of course. A midnight showing has been added to the schedule here in town on Friday. I'll try to pick up all the lines I missed (drowned out by laughter, often my own), soak in more of the music score, savor my favorite lines delivered in Mal's choked-up mumble (a little bit Duke, a little bit Elvis), and spend a few obsessed fan moments trying to figure out what the heck was written in katakana on River's "notebook" (misutori - mystery?) and on the Tams' room on the ship (serisu - series?). My Japanese is quite rusty, and it went by too fast the first time. Update (September 30, 2005): Went to the midnight showing this morning. Stadium seats, triple-sized Ultrascreen, full house of Whedon devotees (Joss put the "cult" in "culture"). The katakana went by way too fast (again), but I saw enough to know that my attempted transliterations in the post above are mostly way off. The movie is even better on a second viewing. Whedonesque is collecting an impressively comprehensive list of reviews from all over; the list of Technorati links is not so impressively comprehensive (doesn't even pick up the posts from this blog, sniff) but it's long; it's Serenity all day, all the time (well, this week anyway) at The Flick Filosopher; this review at Blogcritics includes a helpful handful of links to other blogger reviews (many of which in turn include links to other reviews, and so on, and so on); but the best review I've read so far has been Stephanie Zacharek's at Salon. She gets it right: much as we all love the fact that this movie was able to get made (and shut eyes tight, everyone, and whisper "franchise"), we should lament the missed opportunity to sink our teeth into these characters over the full run of a TV series. Having immersed myself in Firefly this weekend (all fourteen episodes, in order), I'm appropriately frenzied about Serenity. I'm signed up for the screening for bloggers in Waukesha on Tuesday. (The quid pro quo for the free pass is to post the blurb below, include a link to the movie's web site, and tell y'all what I think about the film after I see it. If I get a seat, you'll hear from me on Wednesday.) In the meantime, I'll be shuffling and reshuffling my mental list of Firefly's top three episodes (today, it's 1. "Shindig"; 2. "The Message"; and 3. "War Stories"), and trying to figure out all the actors on Firefly who cross-pollinated 24 (and vice versa). Joss Whedon, the Oscar®- and Emmy-nominated writer/director responsible for the worldwide television phenomena of BUFFY THE VAMPIRE SLAYER, ANGEL and FIREFLY, now applies his trademark compassion and wit to a small band of galactic outcasts 500 years in the future in his feature film directorial debut, Serenity. The film centers around Captain Malcolm Reynolds, a hardened veteran (on the losing side) of a galactic civil war, who now ekes out a living pulling off small crimes and transport-for-hire aboard his ship, Serenity. He leads a small, eclectic crew who are the closest thing he has left to family–squabbling, insubordinate and undyingly loyal. Welcome to the thirteenth edition of The Carnival of Music. Palliative music: ...and more thanks to Don for the pointer to this fascinating article on harpist and soprano Therese Schroeder-Sheker's pioneering work in music-thanatology. It's so funny how we don't sing any more: The self-titled "Headmistress/Zookeeper" of The Common Room asks the excellent musical question: whatever happened to singing in daily life? Music out of chaos: For a couple of teeth-chattering tales of gigs gone wrong, here's a sad saga from Melinama of Pratie Place about the bad things that happen when a performer can't be in two places at the same time, and the behind-the-scenes history (found via be.jazz) of the making of Charles Mingus's The Complete Town Hall Concert. Remembering Robert Moog: Noteworthy remembrances include this tribute by Keith Emerson (found via Colby Cosh) and this post by Mr. Sun (including a link to his earlier post featuring the Bob Moog action figure). And now, a bit about the snapshot at the top. 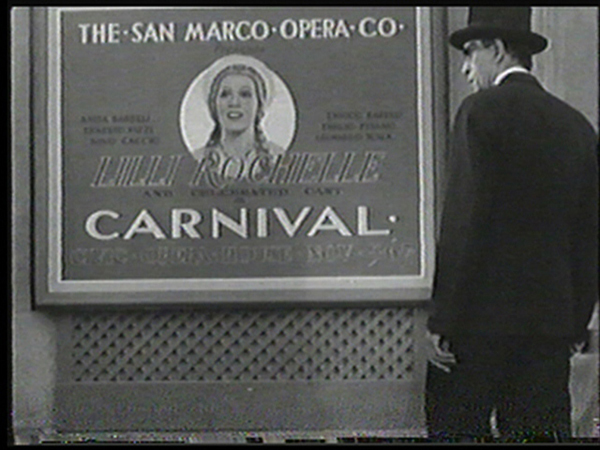 It's the poster-within-a-movie for the opera-within-a-movie "Carnival," whose music was composed by Oscar Levant for the movie Charlie Chan Goes To The Opera. 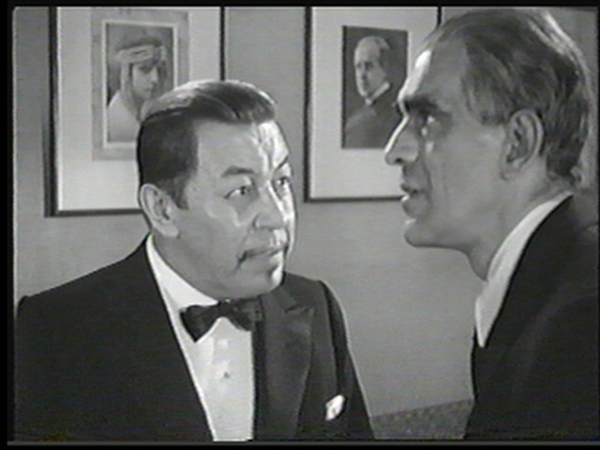 According to Levant's memoir A Smattering of Ignorance: "This epic in abnormality brought together Warner Oland, as Chan, and Boris Karloff as a Mephistophelian Bing Crosby, for the first time in pictures. The producer's blind instinct, coupled with a limited budget, had sought me out to compose the opera." (Karloff is quite the good sport in this movie, hamming it up with gusto, in a sibilant baritone speaking voice that is unnervingly reminiscent of Jeremy Irons.) Levant's influences? Not Schoenberg, and not Beethoven: "Having had little experience in writing opera, I asked Schönberg for some advice. He advised me to study the score of Beethoven's Fidelio. Since this is one of the most unoperatic of all operas it was just what I didn't need." 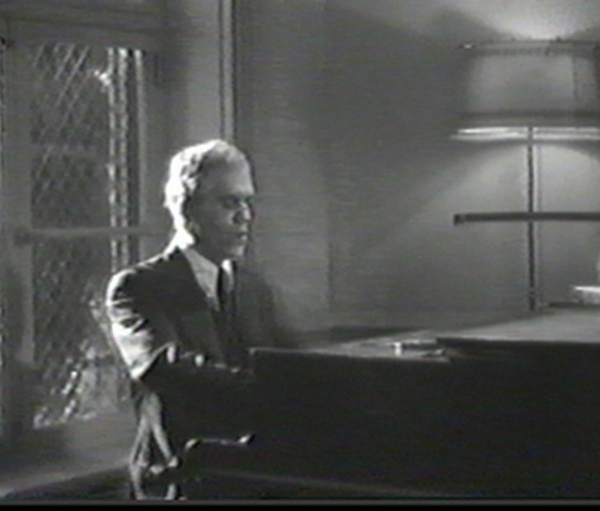 You're the Piano Man: Charlie Chan At The Opera opens with a scene that takes place on a dark and stormy night in an insane asylum, where an amnesiac whose identity has been a mystery for seven years is engaged in his nightly ritual of playing the piano and singing an operatic aria in a foreign language in the sanitarium's rec room...not unlike this summer's "Piano Man." More on this summer's now-solved mystery is found On An Overgrown Path. Here, Karloff is the baritone Gravelle, who escapes the sanitarium in order to take the stage again in his signature role. Levant describes the aria (sung here and in the pivotal scene of the opera) as "a potent mingling of Moussourgsky and pure Levant." 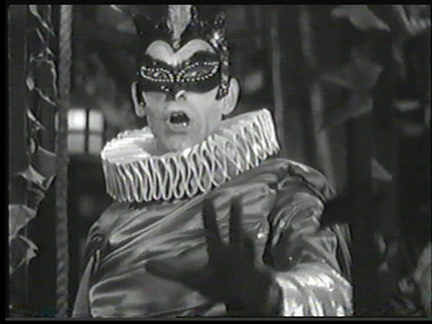 Boris Badanoff, er, Karloff plays the role of Mephisto in "Carnival." Frankenstein: Before Charlie Chan At The Opera, Boris Karloff had already achieved fame and notoriety for his role as the Monster in Frankenstein and Bride of Frankenstein. 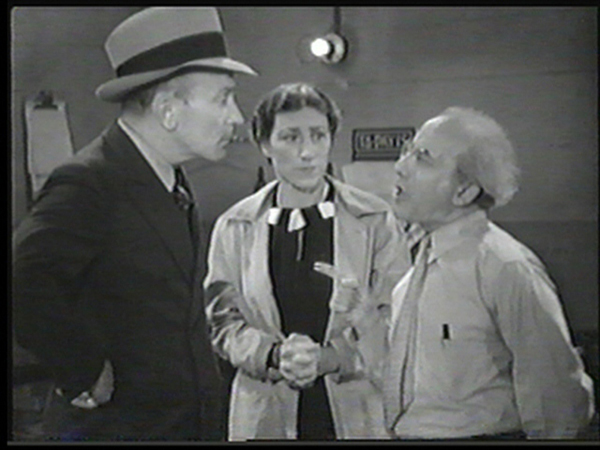 (In this scene, William Demarest, playing a police detective assigned to assist Chan, which he does with all the sputtering, indignant cluelessness that he will have honed to perfection as Uncle Charlie in My Three Sons decades later, is informed by the opera's stage manager that "This opera will go on tonight even if Frankenstein walks on stage!") Dr. Frankenstein created his monster by grafting together parts from body-snatched remains, but a project with much happier results is Dynamite Ham's "I Believe In You", a unique Frankenfusion of songs of Dr. Frank and Frank Loesser. Costumes from hell and heaven: Levant recalls that "Twentieth Century-Fox had just completed an elaborate spectacle with Lawrence Tibbett, of which one of the high spots was a Faust scene in which the star wore a magnificent Mephistophelian costume. [....] One of our first problems arose when the costume was assigned to Charlie Chan at the Opera, with instructions for us to put it to work. I had heard of music being written around a singer, but never for a costume. Nevertheless, determined to become a cog in the wheel, I set myself to writing an operatic sequence in which the big aria found a baritone wearing this elegant Mephistopheles costume." (Surely you jest, Mr. Levant.) 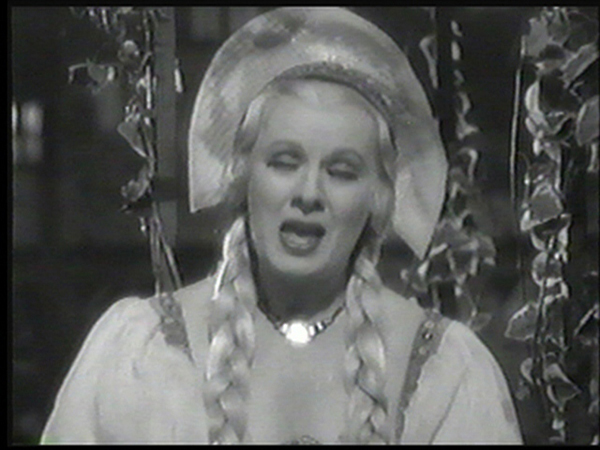 For a costume for the opera that truly is to die for, let's look in on Anne-Carolyn as Lucia di Lammermoor at the concert. The Valhalla Effect: That's the name given to the unusual transfiguring phenomenon that occurs (only?) in The Fredösphere, applied here to Madame Lilli Rochelle, the soprano in "Carnival." Thanks to those who submitted posts, and also to those who may be waking from innocent slumbers to find that their posts are unwitting (but, I hope, not unwilling) participants in this week's Carnival. Special thanks to TexasBestGrok's JohnL, The Carnival of Music's creator and impresario. Music is timeless, and so is the Carnival: visit the Carnival of Music page for links to prior Carnivals, to volunteer to host a future Carnival, or to submit entries, and be sure to join the Carnival again next week when it appears at Owlish Mutterings. I've been a fan of Guys and Dolls for years and years, but I'd never seen it performed live until last month, when our neighborhood high school (James Madison Memorial HS, "Memorial" for short) put it on as its winter musical. The curtain opened to the three "gamblers" taking on "Fugue for Tinhorns"—and they nailed it. The show had a Nathan Detroit that could dance as well as he could sing as well as he could act, but everyone was adorably terrific (including the orchestra, which played smartly throughout). What a blast! And the Mankiewicz film adaptation of Guys and Dolls showed up on the classic movie channel last week. I try to catch this movie whenever it's on TV, despite its flaws. Some of the best songs of the show were left out of the film (a blessing in disguise, probably, as I shudder to imagine Brando attempting "My Time of Day" or Jean Simmons doing "I've Never Been In Love Before"...'cause ain't neither of them can sing), and the songs that were added on for the movie are jarringly not great. Brando is a most peculiar Sky Masterson, but his scenes with Jean Simmons have great chemistry (yeah, chemistry). I mostly enjoy just looking at the movie—a brightly costumed fairy tale. When music videos in the eighties tried to cop the look, sometimes it worked (Janet Jackson, before she went to seedy, in her playful "When I Think of You"), and sometimes it didn't (the retro-Weimar grotesquerie of Madonna's "Open Your Heart"). My favorite cast recordings of this show are (no surprise) the 1990 Broadway revival (in which the women—Faith Prince as Miss Adelaide and Josie deGuzman as Sarah Brown—are particularly perfect) and the original cast album from the fifties (mmm, Robert Alda as Sky, sigh). The cast album from the 1976 revival that headlined Robert Guillaume doesn't quite have the same spark, and although produced by Motown, its TSOP-style orchestrations bring on a strange compulsion to Do The Hustle! And before the days when you could sample before you bought, I picked up a star-turn studio recording with Sinatra (Nathan Detroit in the movie, Sky on this recording), and Dean Martin, Debbie Reynolds, Bing Crosby, Dinah Shore, among others, along for the ride. It's ghastly. Well, mostly—Sammy Davis, Jr. turns out to have just the right timbre and pitch for "Sit Down, You're Rocking the Boat", the only saving grace of this "what were they thinking?" production. 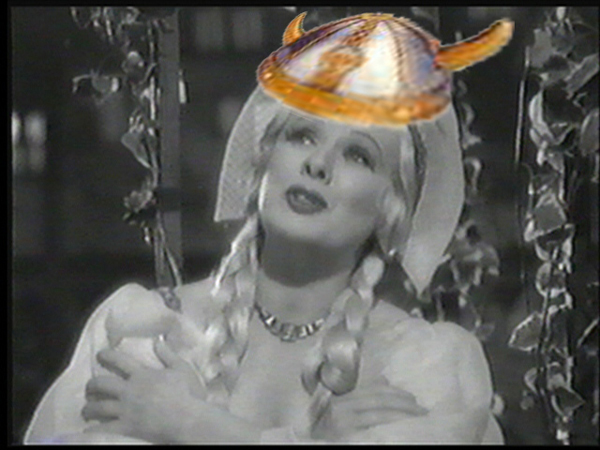 In the original Frank Loesser score, the expression is "sheep's eye and the LICKERISH tooth." Loesser eplained how he arrived at it in a letter that's printed in his daughter's fine biography of him, A MOST REMARKABLE FELLA (page 109). The short of it is that he wanted a companion word that meant "covetous", fearing "sheep's eye" did not completely convey the exact thoughts of the guy who would be gazing at her. He went to Roget's and found that "lecherous" was a sort of synonym for covetous, but didn't quite like the way it sounded, so he consulted the Oxford English Dictionary and found that two archaic spellings of "lecherous" were "licorice" and "lickerish." He chose the latter. Voila! [Original poster responds:] Many thanks [...] - I've been trying to tease out the meaning for many years. My ear always heard that application, but I couldn't come up with the "lickerish" thing. Thanks again - I can sleep easier. Halloween weekend in Madison has attracted some unwanted infamy these past few years, although the partying this year seems to have been more Bourbon Street Mardi Gras than Devil's Night. Since I find that two's a crowd in most situations, there had to have been some pretty compelling reasons for finding myself on campus both nights of Halloween weekend. On Saturday night, there would be an I've-died-and-gone-to-heaven program with the Pro Arte Quartet performing Beethoven's E-flat major String Quartet (Op. 127) and the Schubert String Quintet in C major (D. 956) (two-cello, with guest cellist Jean-Michel Fonteneau joining forces with Pro Arte cellist Parry Karp). And on Friday night, it had been time for more Ozu: a double feature of the films Late Spring and The Flavor of Green Tea Over Rice. Late Spring is the story of a widowed man whose unmarried daughter is still at home. He's an absent-minded professor who couldn't manage to keep himself in clean shirt collars, much less keep himself fed and his house clean without her care. Or is that the story? The daughter's in her twenties, and if you'd ask anyone around her (especially her busybody aunt), they'd tell you that it's getting past time for her to marry. No question that she'd be a catch. She's beautiful, kind-hearted and selfless. And if you'd ask her, she'd tell you that she would never leave her father with no one to take care of him. Or is that the story? Before too long, people conspire to arrange the daughter's marriage and to try to find a wife for the father. The daughter balks at all of this, at every step along the way. One day, the daughter and father attend a performance of Noh theater, and the audience includes the woman who is rumored to become her future stepmother. In an intense, wordless scene, we see the daughter's face as she looks back and forth from her father to the woman. Her expressions are those that you might see on a baby who senses the danger of being abandoned but who doesn't have words to speak and is too overwhelmed to let out a cry: confusion, then fear, then fury. As events progress, the fledgling is gently pushed out of the nest. The daughter agrees to marry, and greets her wedding day with sadness and reluctance. Just before her wedding ceremony, her father explains to her why it's time for her to go, and she obeys. The father returns to the empty house after the wedding. Has the shot of an empty room in a film ever been more heartbreaking? As we've come to figure out through the course of the movie, it's the father that's taken care of the daughter, not the other way around, and in the final scene he pares an apple with a knife and finally, but wordlessly, reveals the full weight of the sacrifice he's made. The story of Late Spring turns out to be the story of how we come into this world, and how we leave it. It's the most deeply affecting film I've ever seen. I would like to see The Flavor of Green Tea over Rice again. I was a bit distracted during its first half-hour or so; I kept having to take my glasses off to mop my cheeks from the lingering effects of Late Spring. This movie looks at the marriage of a housewife and her husband. Her eyes are dead with unhappiness; if you ask her, her husband is dull and "thick-headed". The movie's tidy, happy ending might have been too facile but for the character of the husband, who's a revelation. He is exactly the opposite of how he is superficially perceived by his wife and her friends, and the opposite of how we might first be led to perceive him, as a salaryman bent over figures with his slide rule and account sheets late into the night. When I see this movie again, I'll want to figure out why it is that characters break into song in several scenes, and I'll look forward to seeing again the scene in which the wife and her friends are dressed in matching spa robes, white splotched with black, like the pampered and greedy koi in the pond whose glimmering light is reflected back onto the women's faces as they toss bread crumbs to the fish. The wizardry of Ozu, and a trip down memory lane. The UW-Madison campus film society, Cinematheque, began its retrospective of the films of Yasujiro Ozu last Friday. All paths seem to converge at the Lunchroom, and so it was with this. I'd been reading Jonathon Delacour's appreciations of Ozu's work from time to time over the past year, and then I learned last week that the films were coming to Madison by reading about it on Althouse. The festival screened Tokyo Story as its first film. Is it the greatest Japanese film ever made? Is it the greatest film ever made? I'll leave it to the cineastes to duke it out...but I loved it. It took a simple human story (elderly parents from a country village visiting their grown children in the city) and made it profound, without pretension. It was beautiful—every single frame could have served as its own work of art—but it wasn't just "look at me" beautiful (*cough* Days of Heaven *cough*). The imagery is careful to draw your attention to the movie's themes: family members seated side by side, but not shoulder to shoulder, with side-blinkered gazes (we're all alone); hallways framed by a succession of portals (life's a journey); and white line-drying laundry (I'll go out on a limb here and call this a symbol of death). This movie has reverberated with me, like a song that won't get out of my head, for the past few days. I must have raved about it enough to have driven my dear patient husband to pick up the Criterion Collection DVD for me the very next day after seeing it. I really wanted my husband to come see the movie too last Friday, but it would have been a late night for him, an early bird. (Me, I burn the candle at both ends, mainly with the able assistance of My Best Friend the Coffee Bean.) Seeing a Japanese movie together would have been, well, kind of special, because we met in a Japanese-language class sixteen years ago. I'd taken a year of Japanese during law school as a diversion, and was looking for something that would expand my social circle beyond the first-year-law-firm-associate workplace; he'd been stationed in Japan as a Marine for several years, and was winding down his military career at Alameda Naval Air Station. And so it was that we found ourselves in the same Japanese class, but we've ended up with startlingly different recollections (you might even say Rashomon-like divergences in perspective) as to the invitation that led to our first date. As I remember it: (The Marine's talking to me in Japanese, but he's hardly looking at me. And he's mumbling.) I'm sorry, but I didn't understand what you said. Could you say it again, please? As he remembers it: [In perfectly clear, articulate Japanese, he says:] Would you like to have dinner next Saturday evening? [The reply he hears:] You're mumbling! You're going to have to speak up if you're going to talk to me! Although we missed out on a date with Ozu, we didn't pass up the chance to catch the IFC "Samurai Saturday" offering the next morning: Kurosawa's Seven Samurai. ...for someone who might be wondering just what to get his wife for her upcoming forty-fifth birthday (and with two whole months' lead time! ): the new boxed set of five films of John Cassavetes. (John Cassavetes: the epitome of cool; the epitome of hot.) Thanks to George Hunka's Superfluities, via 2blowhards, for the link. I love this (not)...a suffocating pillow of a head cold that seems to be inducing extreme lightheadedness by shutting off the flow of oxygen to my brain. In the background, TV: Bravo is running "Big Night" right now, a nice comfortable blur of Louis Prima, Tony Shalhoub, Ian Holm, Allison Janney and Isabella Rossellini (and Marc Anthony? can you believe Marc Anthony?). (Wonderful movie, but [folks, trust me on this] don't taint your experience of it by seeing it during the queasy phase of your first trimester, as I did when it was first released.) Cut to commercial, and I hear (humiliating confession time) that whistling song that I just love from the Geico commercial with the happy dog leaning out the car window. Must track down that music. Surf, surf, surf. Look! The Geico gecko has a blog. The GECKO's Blog says: "For the 'Dogs' ad, we used the song, 'Lonesome Magic Vice Harvest' by Alexandre Geindre. The song is available on the CD entitled 'Fashion Week #1'." Naptime? Yes, naptime.